This Saint, a Parthian by race, was the son of Anak. He was born about the year 240 and was taught the Faith of Christ in Caesarea of Cappadocia. He entered the service of Tiridates, King of Armenia, but when discovered to be a Christian, he was subjected to many horrible torments at the King's hands, then was cast into a pit of mire with poisonous serpents and left to die. By the power of God, however, he abode there unharmed for fourteen years, his needs provided by a certain widow, until he was made known by revelation and set free. He converted to piety innumerable multitudes of Armenians, including Tiridates himself, and was consecrated bishop by Leontius, Archbishop of Caesarea, to shepherd the vast flock he had gained for Christ. He spent the last part of his life in retirement in the ascetical discipline, and reposed in peace about the year 325. Saint Gregory is honoured as the Illuminator of Armenia. Let us the faithful today all acclaim with divine songs and hymns the renowned hierarch Gregory as an athlete for truth's sake, as a shepherd and teacher, a universal luminary bright with splendour; for he intercedeth with Christ that we be saved. 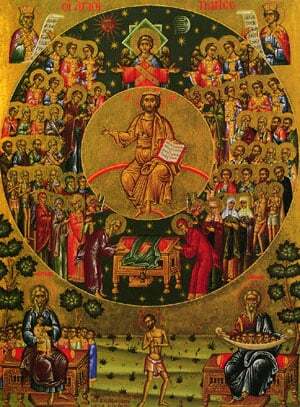 Share the feast of Gregory the Illuminator, Bishop of Armenia with an icon greeting ecard.